Caren is a Speech and Language Pathologist with a wide range of experience. 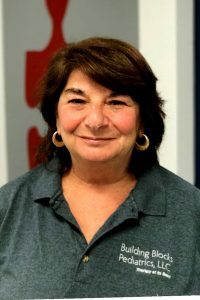 She came to Building Blocks after retiring with over 30 years of experience in Cobb County Schools. Care obtained her undergraduate degree from University of Georgia and her Master’s degree in Speech-Language Pathology from Georgia State University. In addition she holds an advanced Educational Specialist degree in Early Childhood from Georgia State University. Caren especially enjoys working with the pediatric population and their families. She demonstrates high level skills working with a wide variety of disorders including, but not limited to those with cognitive, learning and social/pragmatic difficulties. She prides herself on her empathy and patience towards all children. In her spare time, Caren enjoys spending time with family and especially doting on her grandchildren.